Más información Description: GIUFFRE BROS. CRANES IS SELLING A MANITEX 2892C 28TON CAPACITY BOOM TRUCK W/ A 92’ 4-SECTION PROPORT. BOOM WITH 102’ WORKING TIP HEIGHT, 300’ EIPS IWRC WIRE ROPE, LMI W/ AUDIO/VISUAL CAPACITY ALERT & SHUTOFF (HARDWIRED ATB), 70 GAL RESERVOIR W/ SUCTION STRAINER & BALL VALVE, ELECTRONIC THROTTLE, H.H. 22’ X 8’ WOOD BED AND MORE! MOUNTED ON A NEW 2018 FREIGHTLINER 108SD TRUCK, 60,000 G.V.W.R., 350HP CUMMINS TURBE DIESEL ENGINE, ALLISON 6-SPEED AUTOMATIC TRANSMISSION, REINFORCED INNER FRAME, A/C, CRUISE, 60 GAL ALUMINUM TANK, AND MUCH MORE! TO SEE OUR FULL INVENTORY OF BOOM TRUCKS PLEASE VISIT OUR SITE. 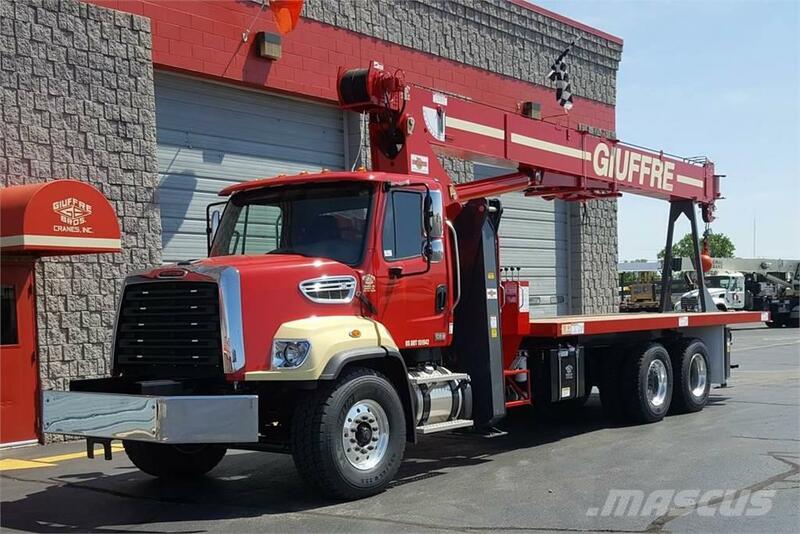 GIUFFRE BROS. CRANES HAS NEW & USED TEREX BOOM TRUCKS, NEW & USED MANITEX BOOM TRUCKS, NEW FASSI KNUCKLEBOOM CRANES & USED NATIONAL BOOM TRUCKS FOR SALE.